From the teachings of Mawlana Shaykh Hisham Kabbani as Taught by Shaykh Sayed Nurjan Mirahmadi. Allah (aj) in holy Quran says, I am going to teach you within yourself and upon the horizons. You will see My signs upon the horizons and you will see My signs within yourself. It means the way of tafakkur and contemplation is that there must be a reality within me and there must be a reality that Allah (aj) is showing upon the horizons. If we don’t understand the secret of tawaf, then we do not truly understand what Allah (aj) wants from us. The tawaf is the circumambulation of the holy Ka’bah. It means for us it is a deep reality. We find out now within ourselves, that our whole holographic image is based on this reality. The whole of our being is based on love. That love, the scientific and reality of love; not the love of lust and people jumping on each other. This is the divinely love, in which the divinely presence grants to our smallest being, our elements, our electrons. The nucleolus of our being is the center of love. If you don’t understand the smallest, you don’t know what you are doing. It is like you are going around the rocks and stones and become idol worshipers, astaghfirullah (asking for forgiveness). There must be a reality that a believer must have to understand within their heart. Before I can truly sometimes understand, I have to reflect within. Now alhamdullelah (praise be to Allah), they are teaching us from our atoms. The atom is circumbulates the nucleus. Why is it circumambulating the nucleus? Why do we have the whole hologram of our being based on that love? It means the divine put within the nucleus a divinely love, an attraction; what they call it mass attraction. It is such a powerful attraction that the outer elements want to collide; they want to go in to the nucleus. 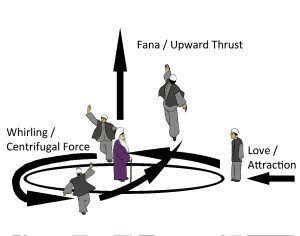 As a result Allah (aj) creates a slight gentle force. There is a strong nuclear force and a weak force. That weak force is just enough to slightly push. If it was any stronger and hit, then all of the holographic image will be non existence because it will send your love away. It’s enough of strength that your love gets into the nucleus and Allah is not giving permission. Therefore, now you begin to look for another way. When the love is there, you are not stopping, so your elements don’t stop. The mass attraction they describe like this; from the circumference your elements want to come to the nucleus. They are attracted by their very being. They have to be into the nucleus because of love, divinely love, a pure, sweet and innocent love. As a result, the electrons don’t stop, they have no ego. No ego is telling them that, no go away this is not for us. The electrons move because of the love, like a magnet it pulls. They move, they move, they keep moving to find a way in. They want to be in the nucleus. It means the electrons; they begin the reality of tawaf. They are going around looking for a way to collide with the center. They want to reach the divinely presence or the symbol of divinely presence because, there is nothing like on to the divinely presence. It’s a divinely light, divinely qudrat (power). Later they describe what that light is. It means that the electrons and the elements want to and they begin to move. As a result of their yearning and their love, they are moving to the center, moving to the center. They begin the circumambulation, they begin the tawaf (circumambulation), they begin the tawaf, and they begin the tawaf. And because they have no ego, they are lost within that love. All the atoms are moving and spinning at a rate of speed that is no comprehensible for us. The vastness of our creation, the vastness of our electrons; all are spinning out of divinely love, giving us an appearance. Allah (aj) says, this life is but an illusion. Scientist says yes, all of it is an illusion. If the spin stops, it collapses to nothingness. It collapses to something not as great as the sizes that we are seeing. That is the reality of love and that is the reality of our being. Allah (aj) says everything is in my praise. Everything is in existence out of that divinely love. Then we find the earth spin around the sun. It’s not shirk! But, the sun is the symbol of divinely light. Which is greater? The sun or the light of Sayyidina Muhammad (saws). It’s not comparable. The light of the prophetic souls, far out does any imaginary light of the sun because it’s all within the bound of creation. Allah (aj) says, this creation is not like a wing of mosquito for me, in value. It begins to teach us that everything is in tawaf (circumambulation) around the light. The planets make tawaf around the sun. They used to think before that the sun makes tawaf around the earth. But no, the physical must make tawaf around the spiritual, the light. The light is eternal. And all the planets on them are making tawaf around the sun. And everyone on the planet is making tawaf around the sun. Innama nut’imukum liwajhi Allahi la nureedu minkum jazaa an wa la shukoora. They begin to teach us, look at the greater reality. You like it or you don’t like it, Allah (aj) is making you to make tawaf around the sun. Because Allah is showing the azzimat, the greatness of His greatness. Study the sun. Not to worship the sun because, tawaf is an expression of love. Worship is our salat, prayers and acknowledging the divinely presence and praying to the divinely presence. These are the ayats (signs) and isharats of the divinely light, divinely creation. Study the sun, and see that your breath is coming from the sun, through photosynthesis. Your vision is coming from the spectrum of light that you can see from the sun. Our whole existence on this planet is from the sun. As a result of respect and ihtram (respect), Allah makes the earth to go around the sun. Be thankful and say shukur (thanks) to me and be thankful to my creation that I give you. All planets begins to circumambulates the sun out of their thankfulness because Allah‘s ‘izzat (honor) and Allah’s might and power is in that reality. Allah wants good character. He says, be thankful for what I am giving you. We said before, which is greater? When you study the sun, you say all of that is coming from the magnificence of the sun. But, the magnificence of Allah (aj) is the power upon that sun. Your breathing, eating and all your abilities come from that. We said which is greater the sun or the light of prophet (saws)? The light of prophet (saws) is greater. Now how much do you owe the reality of prophet (saws). If the sun is doing that for you, imagine the reality of where that sunlight is coming from. These are the sir (secrets) of Lam Jalala. Everything must come from the secret of la ilaha ilAllah and goes directly to Muhammadun RasulAllah and comes out. This is for us the reality of tawheed and oneness. This is what Allah (aj) showing that for my ‘izzat to appear, it must be appearing through the reality of prophet (saws) and the prophetic reality of all the prophets. They carry that reality. Their lights far out shine that sun. Once we begin to understand how much blessings we get from the sun, how much nourishments we get from all of that. Allah (aj) says, just you think then what are you getting from the reality of the souls of whom I love. My light is upon their hearts. 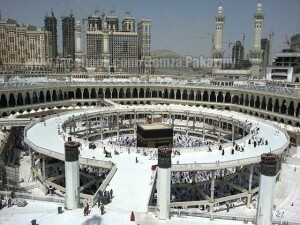 Now begins to open the reality of tawaf. When we understand the micro reality of our being is moving in this love. We are in a hologram of that love. If for any moment the electron stops its love, it collapses. We cease to exist. Yusabihu bi hamdeh. Allah (aj) says for verily everything is in my praise, in resonance, in an atomic resonance. Their atoms are resonating. It means they are singing. Now they have a technology that they can hear the earth sing. All spiritual masters teach; they can hear the planets. Everything has a frequency, the wood has a frequency, the glass has a frequency, the earth puts out a frequency, the planets and the sun and put out a frequency. It means they are making a dhikr. maa wasi`anee ardee wa laa ardee wa laakin wasi`anee qalbi `abdee al-mu’min. but the heart of my Believing Servant. He is not talking about me and you. He is talking about the prophetic reality. Qalbil Mumin baytullah قلب المؤمن بيت الله (Heart of the Believer is House of Allah). It is very easy. This is a truth in the plane site. The best truth is hidden in the plane sites because people think, no it got to be more complicated than that. No! The heart of the believer is the house of God. Divine says there is nothing up there that is going to hold Me and there is nothing down here that is going to hold Me. But the heart of My believer is My house. It means I reside, my ‘izzat, my might resides within that but not for you and me. Not now. This is towards the understanding of greatness of the prophetic reality. When we go to the ka’bah and say ya rabbi (oh my lord) but the hadith is qalbil mu’min baytullah, now I am facing baytullah (Allah’s house), there must be the Qalb e Mumin (Heart of the believer). Why are you guys making it difficult? The qalbil mu’min. Who are we talking about? It is the heart of the prophet (saws). Allah (aj)’s only concern is prophet (saws)’s reality. 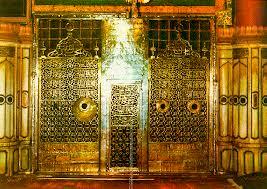 That the qalb(heart) of Sayyidina Muhammad (saws) is My house. And if you arrive at His house, who is there? The Mu’min (believer)! It’s the rohanyat of Sayyidina Muhammad (saws). Because of the rohaniat (spirituality) of Sayyidina Muhammad (saws), Allah (aj) sends His tajali (light). Why, you think Allah sends His tajali on the bricks so the bricks will be holy or the water and the cement? Or they think may be the khiswa the fabric is holy. They cut it (khiswa) up every year and sell it for billions of dollars to everybody who believes. Allah (aj) is sending all that tajali on a fabric? There must be something there that every mu’min, needs. Because the rules of paradise is that when you move to paradise, you can never be taken out of paradise. There must be a paradise light there. There must be rohanyat of prophet (saws) there. As a result, all the real mu’min (believers), all the real mukhlis (sincere); Allah (aj) puts a drop of their arwah (souls), drop of their souls; just even an atom is enough. As a result, Allah (aj) puts a drop of the arwah of all the real mu’min (believers), all the real mukhlis (sincere); there. A drop of their souls; just even an atom is enough. That atom is enough to reflect back to their physicality or to their souls, wherever their souls are in barzakh (Purgatory) or in dunya (material world). Because one atom is as if all the atoms are there. All those lights and all those atoms must be at the holy ka’bah because, this is the hadith. Qalbil mu’min baytullah. Now I came to the baytullah; where are the mu’min? As a result of that, Allah (aj) says, you make tawaf طواف! Weren’t you making tawaf around the sun? Which was better? You had no choice in the tawaf طواف around the sun; you sit on the earth. You can’t say no put the break, I am not going to make tawaf around the sun. Allah (aj) is showing you that light, you have ihtram (respect), you have respect. Sit on the ard (earth) and go around the Shams (sun). We have no choice. The earth makes a tawaf around the sun at the speed of 6700 miles/hour. They begin to teach, there must be very holy souls residing in ka’bah. That’s what brings Allah’s nazar (gaze) and tajali (light). As a result, their souls inside the ka’bah, they are making tawaf around Allah (aj). Because the reality of their souls, the heart within their souls; inside there is making tawaf around Allah (aj). Just like the Sun is making a very slow tawaf. It is making a tawaf to the ‘izzat that it is dressed by. The earth makes a tawaf all the way to the Pluto but, they keep the Pluto out. But, they keep the 9th planet out. Whatever it is, that entire galaxy and universe are all making a tawaf. mam. The Imam recites, he carries the jama’a behind. If the imam is bad, the prayer is off somewhere else. Allah (aj) is showing us that for the sake of that holy light, My nazar (gaze), My dressing, and My blessing is upon that region. As a result, you come by imitation and make a tawaf to be dressed by the lights that those holy souls are already being dressed in. Lam jalala. This is an active state of reality of prophet (saws)’s soul. It’s active because qalbil mumin baytullah and everybody is coming to receive those lights from the Prophet (saws), from the lights of all the souls of all the mu’min (believers), from Ashabin nabi (saws) (Prophet’s companions), ahlul bayte Nabi (saws) (Prophet’s family), and awliya Allah (saints). People are coming to receive those lights. What do you think then about the lights of Madinatul munawera. Now we look at the other part of that hadith. When you go to Madina? What is in Madina? Prophet (saws). What is there? The qalbil of the mumin. The real qalb (heart) that Allah (aj) has created. That house (ka’bah) baytul ‘atiq بيت العتيق (the ancient house), is brick and stones that you made with your hands. Allah made it to be holy by the souls of very holy souls. As a result of their souls and their worship, Allah wants you to come and be dressed by that light. Like the sun they are emanating lights. By you just imitating, these lights will dressing and blessing upon you. Just like imam, when it comes time to pray; Prophet (saws) is the Imam. Prophet (saws)’s prayer to Allah (aj) counts and we are the jama’a (people following the Imam in prayer) in Mecca. But, that is baytullah; qalbil mumin. Qalbil mumin (the heart of the believers) are there. But, if you go to Madina, this is where the Mu’min resides. So What is there? Baytullah (house of God). Do we get it? Baytullah. 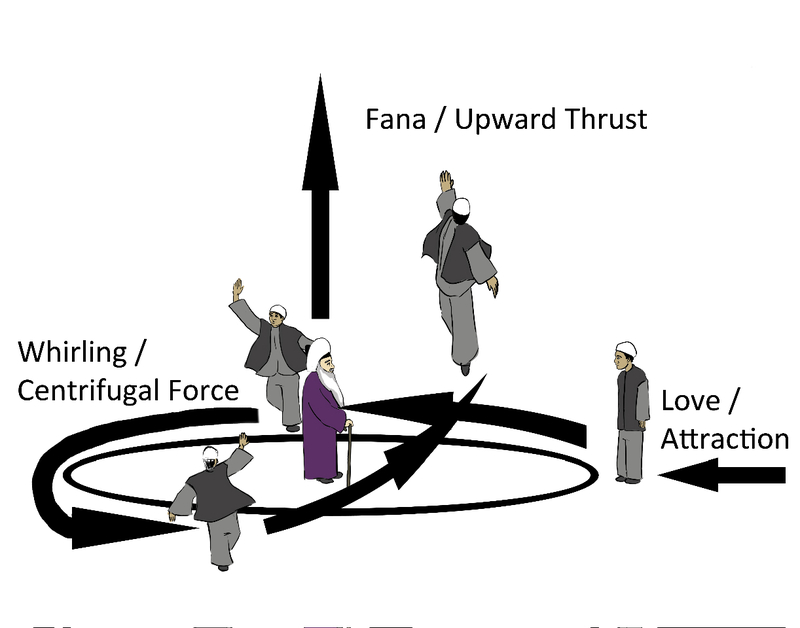 When you go to Madina tul munawera, prophet (saws) is in fana (annihilation). Mecca in binary code is one and Madina is zero, Nuqt. Prophet (saws) in is in complete annihilation. As a result of annihilation, the heart of the prophet (saws) IS where Allah (aj) is residing; therefore the light of Allah (aj), the realities and the divinely presence. If we don’t understand the reality and the relationship of La ilaha ilAllah, Muhammadun Rasul Allah (saws), then we are constantly off of our understanding. That’s why prophet (saws) came and brought us and thought us to say La ilaha ilAllah, La ilaha ilAllah, La ilaha ilAllah. Make dhikr of Allah, Allah, Allah. But what did Allah (aj) teach you to make dhikr of? In Allaha wa Malayikatahu yusalona alan Nabi. This is the relationship. Prophet (saws) is teaches, Mecca. Bring yourself to oneness, understand the greatness of the divinely presence. But, even there is the heart of the believers because Allah (aj)’s love is residing there. As a result of Mecca and the acceptance of the tawaf of Mecca, Allah (aj) says, now I want you to be dressed by My divinely presence; you go to Madina. In Allaha wa Malayikatahu yusalona alan Nabi (Allah and his angels send blessings upon the Prophet (saws). Forget about the Ya ayu hal ladhina amano (oh those who believe). They don’t care about the rest. But Allah (aj)’s dhikr and malayika’s dhikr is on Madina tul Munawera. Allah’s nazar and presence and divinely lights are in Madina tul Munawera. And all malayika from the beginning of creation to the end of creation, must be present and making salawat on Sayyidina Muhammad (saws). Subhana rabbika rabil ‘izzati ‘ama yasifoon, Wa salamun ‘alal mursaleen wal hamdulillahi rabbil ‘alameen. Bi hurmati Muhammadil Mustafa wa bi siratil suratil Fatiha.